Martin Rice Reviewed by Robin Thorburn on I would like to express my gratitude for the excellent, professional service that I received with my implant, not only from Dr Bharadwaj but to all the staff at Meadowbank Dental Practice. They were skilled, considerate and caring, both throughout the procedure and during the aftercare. 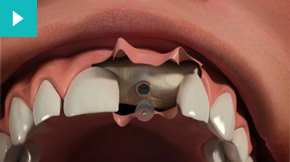 Dental implants are a common and highly effective solution for missing teeth. Implants can replace a single tooth, several teeth or even all of your natural teeth. Although they have a higher initial cost than other missing tooth solutions such as bridges or dentures, this is balanced out by a lack of the recurring costs that are associated with alternative treatments. At Meadowbank Dental Practice, all dental implant surgery is carried out by oral surgery specialist Dr Girish Bharadwaj. Dr Bharadwaj has a special interest in Implantology and has many years of experience working in this field. He qualified in India, studying first at Bangalore University then obtaining a Masters in Dentistry from the University of Kerala, with a focus on Prosthodontics and Maxillofacial Prosthetics. Since then he has undertaken extensive training in oral surgery and is a Member of the Royal College of Physicians and Surgeons of Glasgow and a Fellow of The Royal College of Surgeons of Ireland. He has been practising Oral Surgery at Meadowbank since 2006 and has a strong interest in bone regeneration. He is a Diplomate of International Congress of Oral Implantologists. Girish lectures widely in oral surgery and implantology and works as an associate specialist in Oral Surgery at Queen Margaret Hospital in Dunfermline. A dental implant is a small titanium screw that is placed directly in the jaw bone to replace a missing tooth or teeth. A crown, denture or bridge can then be securely fitted on top. The end result looks and functions very much like a natural tooth. Dental implants have a very high success rate and are a tried and tested method of replacing missing teeth. So long as they are well looked after, dental implants should last for a very long time - perhaps even a lifetime. At Meadowbank we accept referrals for dental implants from practices across Edinburgh and beyond. Martin Rice Reviewed by BW on I would like to thank you for your professional care and service I have received from the very first day I had my Implants fitted in 2009. I have received the highest standard of aftercare and the Implants have changed my lifestyle. I would like to thank all the staff members at Meadowbank Dental Practice for their kindness. Martin Rice Reviewed by AF on I am on my second visit to Dr. Bharadwaj for dental implants. The first implant involved a difficult procedure but Dr. Bharadwaj explained everything fully and patiently and his expertise brought about a successful conclusion. I have total confidence in Dr. Bharadwaj. Martin Rice Reviewed by Dave Wharton on I am very pleased to endorse the implant treatment from Girish and his team. The treatment, whilst lengthy, was meticulous, and the results have been more than I had hoped for. The after care service has been excellent. I have no hesitation in recommending the procedure.